Is there any thrill in WoW greater than a tense 2vs2 showdown? This article was originally published in PC Gamer issue 321. For more quality articles about all things PC gaming, you can subscribe now in the UK and the US. For me, World of Warcraft has never been about the dungeons or the raid bosses. As much as I’ve enjoyed trying to defeat the latest demon lord hoping to destroy all of Azeroth before looting his shoes as a trophy, I would always struggle to return to the same fights week after week. Instead, it was the other half of the game that really got its hooks into me. The often-overlooked PvP. Back in Wrath of the Lich King (the greatest expansion WoW has ever had, if you ask me), I fell in love with its most competitive PvP mode, the Arena. Here you can choose to play in 2vs2, 3vs3 or 5vs5 setups, as you attempt to kill everyone that isn’t on your team before they do the same to you. It’s explosive. This is where the best players in the world (of Warcraft) come to prove their worth. I used to stick to the 2vs2 bracket back then, playing an unforgivable number of matches alongside a buddy of mine each season. He played a Rogue, which is a class very clearly designed for PvP combat with its emphasis on stealth and dealing damage quickly. I, on the other hand, favoured the Shadow Priest. Back in the Wrath of the Lich King days, at least, this meant I spent the vast majority of my time running away from the other team wishing I’d levelled up a Warlock instead. It was fantastic. Similarly to raiding, you do need some decent gear to hold your own in the arena, but two other factors truly separate the best players from the rest of the pack. First of all, you need an encyclopedic knowledge of how each of the game’s classes work. This means learning what their abilities do and how often they can use them. With 12 classes, each offering three specialisations, this is a lot easier said than done. Fighting a Feral Druid, for example, is a different experience to taking on a Balance Druid. Despite them being the same base class, you could be dealing with either a stealthed melee damage dealer, or a giant magical owl. These require rather different responses. The other key to PvP is timing. Many of the abilities in WoW have cooldowns. This stops you from only relying on your most powerful skills over and over again, because that’d be boring and we’d all end up playing mages spamming Dragon’s Breath or something rubbish like that. The trick, then, is to use your cooldown abilities at the right moment, and likely in conjunction with your teammate. But more than that, it’s about noticing when your opponents are trying to do the exact same thing to you. If you see this coming and survive, you’ll suddenly be presented with a window in which your team has the upper hand. With your opponents’ most powerful abilities on hold, they’ll likely want to back off. That’s when you strike. The best example of this rule can be seen with an ability that removes movement-impairing effects from your character. If you’ve been stunned or snared, you can use this ability to escape. It’s a vital part of PvP and an ability you’ll be using in almost every match you’ll ever play, but it’s also got a hefty two-minute cooldown. Use it too early and a good team will punish you for it, controlling how and when you move from that point onwards. This presents some amazing tactical decisions for you to contend with as you’re playing. Let’s say you’re frozen in place for a few seconds while your partner is being shredded to pieces by the other team: do you use your ability now and help them out, but risk being in an even worse situation in a few seconds time? Or, do you try and hold out? Can your teammate survive long enough for that to work? Is that a risk worth taking? Those questions are what I love about WoW’s PvP combat. In the Arena you’re constantly reacting to what’s just happened. It has its problems, of course. 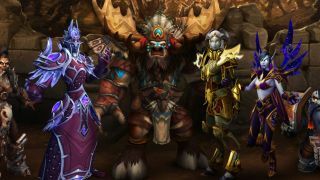 Blizzard has struggled to balance WoW in a way that works for both PvE and PvP. Characters end up using a lot of the same abilities across both aspects of the game and this has caused no end of issues over the years (2009 was cruel for Shadow Priests, let me tell you). But I have such fond memories of my time spent with this game. It’s not for everyone, and it can make for a very confusing spectator sport, but WoW’s PvP is why I play each new expansion. Keep your raid invites to yourself, I’m after the Gladiator title.